Three decades ago, the Texas Transportation Institute (TTI) at Texas A&M University began a ground-breaking project to quantify traffic congestion levels in the larger urban areas of the United States. The Urban Mobility Report project was begun under Tim Lomax and David Shrank, who have led the project over the first 30 annual editions. Perhaps the most important contribution of this work to the state of transportation knowledge is TTI’s "travel time index," which measures the extent to which peak period traffic congestion as to travel times. The TTI data has been invaluable. One important contribution has exposed a fallacious interpretation of the “induced traffic” effect, which holds that there is no point in expanding roadways because they will only be filled up by new traffic. As if more maternity wards would increase the birth rate, the argument goes that we “can’t build our way out of congestion.” In fact the TTI data, which measures at the comprehensive urban area level (and the only reliable level), says we can. I recall a 1980s City Hall meeting with a Portland Commissioner, who admiringly cited Phoenix for not having built a Los Angeles style freeway system. I remarked that if there was anything worse than Los Angeles with its freeways, it would be Los Angeles without its freeways. Then, Phoenix was the 35th largest urban area in the nation, yet had the 10th worst traffic congestion. The situation soon was improved, after Phoenix voters authorized funding for the largest recent freeway expansion program and now Phoenix ranks 37th in traffic congestion, despite having more than doubled in population (now the 12th largest urban area). The lesson repeated itself in traffic clogged Houston, which led Los Angeles in traffic congestion in three of the first four years of the Annual Mobility Report. Under the leadership of visionary Mayor Robert Lanier, freeway and arterial expansions were built, and Houston dropped to rank 10th in traffic congestion despite having since added more residents than live in Portland. Meanwhile, Portland, with its densification and anti-automobile policies has been vaulted from the 47th worst traffic congestion in 1985 to 6th worst in 2012, which is notable for the an urban area ranking on only 23rd in population. Houston’s roadway expansions cleared the way for a Los Angeles run of 26 straight years as the nation’s most congested urban area, with little prospect of improvement. TTI’s traffic congestion ratings were adopted internationally. INRIX, a Seattle based automobile navigation services company was first, providing virtually the same measure for urban areas in North America and Western Europe. More recently, Tom Tom, an Amsterdam based automobile navigation services company issued its own Tom Tom Traffic Index, providing by far the most comprehensive international coverage, adding Australia, South Africa and New Zealand. Tom Tom has just produced its results for the second quarter of 2013. Looking globally, Los Angeles does not look so bad; it didn't even make the top 10 most congested, outpaced (or perhaps better underpaced) by urban areas in Western Europe and Canada. 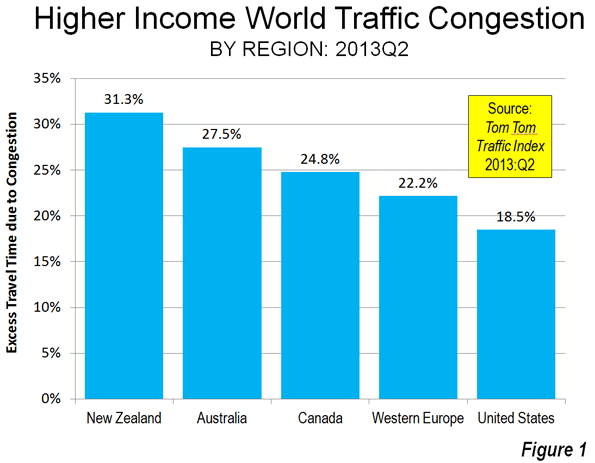 Tom Tom produced data for 122 urban areas in the higher income United States, Western Europe, Canada, Australia and New Zealand. This included nearly all urban areas with more than 1,000,000 population, and some smaller. It might be expected that the “sprawl” of US urban areas, and their virtual universality of automobile ownership, as well as the paucity of transit ridership in most metropolitan areas would set the US to to the nether world of worst traffic congestion. This is not so, and not by a long shot. 1. New Zealand: The trophy goes to, of all places, New Zealand (Figure 1). The average excess time spent in traffic in the three urban areas of New Zealand rated by Tom Tom was 31.3%. This means that the average trip that would take 30 minutes without congestion would take, on average, approximately 40 minutes in the three urban areas of New Zealand. This is stunning. New Zealand's urban areas are very small. The largest, Auckland, has a population of approximately 1.3 million, which would rank it no higher than 25th in Western Europe, 35th in the United States and 4th in Canada and Australia. Christchurch and Wellington are among the smallest urban areas (less than 500,000 population) covered in the Tom Tom Traffic Index, but manage to rank among the 20 most congested (Figure 2). Christchurch and Wellington have little in freeway lengths. 2. Australia: Second place is claimed by Australia. The average trip takes 27.5 percent longer in Australia because of traffic congestion. All five of Australia’s metropolitan areas with more than 1,000,000 population are among the 20 most congested urban areas in the higher income world. In the case of four urban areas (Sydney, Brisbane, Perth and Adelaide), every larger US urban area has less traffic congestion. Melbourne is the exception, but is still “punching well above its weight,” with worse traffic congestion than larger Chicago, Dallas-Fort Worth, Houston, Toronto, Philadelphia, Miami, Atlanta, Washington, Riverside-San Bernardino and Boston. 3. Canada: Canada is the third most congested, with an excess travel time of 24.8 percent. Vancouver ranks as the third most congested urban area (36 percent excess travel time) in the higher income world, and has displaced Los Angeles as suffering the worst traffic congestion in North America. This is a notable accomplishment, since Los Angeles has more than five times the population, is more dense and only one-third as many of its commuters use transit to get to work. 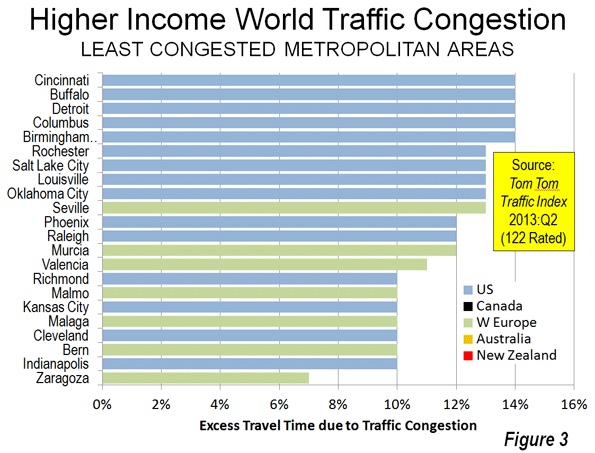 None of the other five largest urban areas in Canada (Toronto, Montréal, Ottawa, Edmonton and Calgary) is rated among the 20 most congested in the higher income world (Figure 3). Toronto is tied for 6th worst in North America with Washington (DC-VA-MD) and San Jose (Figure 4). 4. 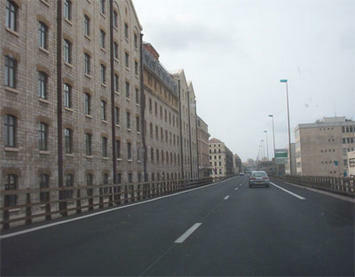 Western Europe: Fourth position in the congestion sweepstakes is occupied by Western Europe, where the excess travel time averages 22.2 percent. 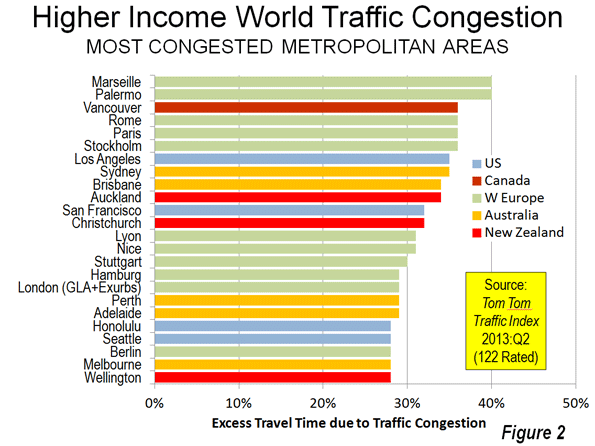 Marseille (France) and Palermo (Italy) are tied with the worst traffic congestion in the higher income world, with excess travel times of 40 percent. Excluding Christchurch and Wellington, Marseille and Palermo are among the smallest urban areas among the most congested 20, though their large and dense historic cores complicate travel patterns. Rome, Paris, Stockholm and Rome, all with strong transit commute shares, are tied with Vancouver for the third worst traffic congestion (36 percent excess travel time). Other Western European entries to the most congested 20 rankings are London, Nice and Lyon in France and Stuttgart, Hamburg and Berlin in Germany. Western Europe contributes only 11 of its 54 rated urban areas to the most congested 20 list (the most 20 most congested list includes 24 urban areas because of a five way tie for 19th). Unlike New Zealand, Australia and Canada, Western Europe has representation in the 20 least congested urban areas (Figure 5), taking seven of the 22 positions (A three way tie at the top places increases the total to 22). The least congested urban area in Zaragoza in Spain (seven percent excess travel time), itself a small urban area of approximately 700,000, while similarly small Bern in Switzerland, Malaga in Spain and Malmo in Sweden are tied with four US urban areas in the second least congested position (10 percent excess travel time). 5. United States: The United States is the least congested in these rankings with an excess travel time of 18.3 percent. Even after losing its top North American ranking to Vancouver, Los Angeles continues to be the most congested urban area in the United States, with an excess travel time of 35 percent. 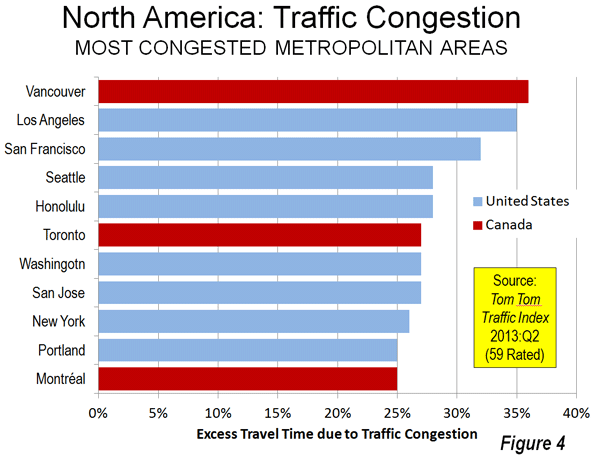 San Francisco (32 percent), Seattle, and much smaller Honolulu (tied at 28 percent) are also in the most congested 20. Only four of the 53 rated US urban areas is in the most congested 20. The US dominates the least congested 20 list, with 15 urban areas. 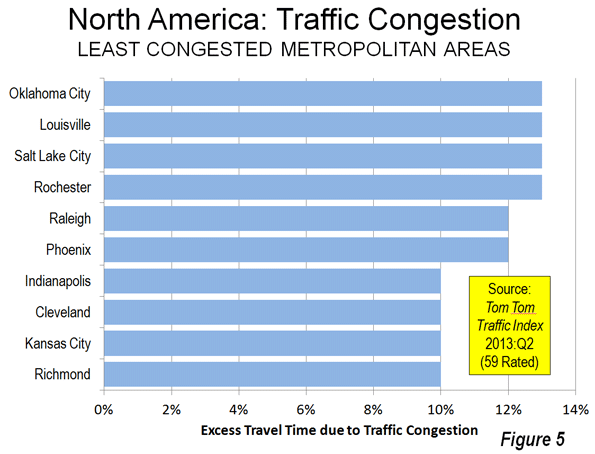 Richmond, Kansas City, Cleveland and Indianapolis share the second least congested position with three Western European urban areas (10 percent excess travel time). Phoenix, which was formerly one of the most congested in the US, is also on the list, ranking as the 12th least congested in the higher income world and the 5th least congested urban area in North America. The Tom Tom traffic congestion rankings are further indication of the association between higher population densities and more intense traffic congestion. But there is more to the story. Residents of the United States also benefit because employment is more dispersed, which tends to result in less urban core related traffic congestion. Lower density and employment dispersion are instrumental in the more modest traffic congestion of the United States, including such large urban areas as Dallas-Fort Worth (the fastest growing high income world metropolitan area with more than 5,000,000 population), Houston, Miami and even roadway deficient Atlanta. Submitted by Mike McGurrin on Thu, 12/12/2013 - 14:02. It would be fascinating to also have the average journey to work time for these cities, to see how the ordering compared. It's quite possible that some of the more congested cities still had average shorter commute times if there is a closer match between home and work locations. Submitted by PhilBest on Wed, 11/13/2013 - 15:15. It should be noted that the low-congestion cities in Spain do have the "advantage" of VERY high unemployment right now. The same goes for lightly-congested Malmo in Sweden - which also has an extraordinarily intense highway network. All sorts of excuses are heard from certain activists, regarding the reasons for low traffic congestion and affordable housing in so many US cities - one of these is that the US is in a recession, its unemployment is high, and its house prices have crashed. My response to this is, is US unemployment all that different to any other country in the world right now? And regarding house prices, many US cities with the most affordable prices, never had a bubble in the first place. In contrast, even busted-arse high-unemployment cities like Liverpool that have urban growth containment, still have unaffordable housing. Submitted by PhilBest on Wed, 11/13/2013 - 15:10. New Zealand would have to be the ultimate example of what happens when anti-car mythology prevails in policy making. Note they have some of the world's most unaffordable housing, too. The percentage delay figures are one thing, but NZ looks even worse if you use the TomTom data for actual time lost in delay per 1 hour of driving at peak. The "percentage delay" measure does not reflect the fact that a road network can be so inefficient that even off-peak travel is slower than it should be. By this measure, Auckland NZ scores 47 minutes per hour and Wellington scores 45 minutes - both considerably worse than North America's worst, and extraordinary for cities of 1.3 million and half a million respectively. US cities that are too small to be included in the TomTom index as yet, such as Wichita and Boise and Provo-Orem, would show up Wellington as absurd as it is; I suspect these comparable US cities have delays of significantly under 10 minutes per hour of driving at peak. Wellington will also be found to be an outlier among small 1st world cities for commuter rail mode share and the fiscal burden of subsidies for commuter rail. I believe a case could be made that diversion of public money from road spending to rail transit has a CAUSATIVE role in traffic congestion increases. Hopefully some enlightened analysts are working on this. I think Thomas Rubin is. Submitted by Variel on Thu, 02/13/2014 - 21:56. "New Zealand would have to be the ultimate example of what happens when anti-car mythology prevails in policy making"
That's a bold claim to make when Auckland's investment in public transport has been almost non-existent for much of the past 60 years. The 1.8km Manukau rail spur, connecting Auckland's two largest urban centers, is the first new track since the 1930s. Nothing about Auckland's development has been "anti-car"
Almost every dollar in capital investment in the Auckland Transport network between 1953 and 2002 was spent assisting car travel. The problem is, even that spending was far too little for an urban area with Auckland's size and growth rate. Submitted by dantheperson on Thu, 02/06/2014 - 16:06. Wellington, at 65% mode share for private motor vehicles, is not at all an outlier. Wellington in fact has higher mode share for private motor vehicles than the other cities in that table having a median of 56% and average of 55%. A case could be made that the diversion of public money into road spending and away from alternatives has a CAUSATIVE role in traffic congestion increases.